Paul Gauguin Cruises is owned by Pacific Beachcomber, under the leadership of entrepreneur Richard Bailey, who serves as chairman and CEO of the cruise line. Bailey, an American, has been living in Tahiti since the mid-1980s. Pacific Beachcomber is a major player in hotels in French Polynesia. It purchased the InterContinental Tahiti Resort & Spa and InterContinental Moorea Resort & Spa in 1998, and InterContinental Bora Bora Le Moana Resort in 1999. The company opened its fourth hotel, InterContinental Bora Bora Resort & Thalasso Spa in 2006. In July 2014, the company opened the new eco-luxury resort, The Brando, on Tetiaroa, an atoll in French Polynesia. Paul Gauguin Cruises was actually created by its previous owner, Vantage Deluxe World Travel, in January 2009. Vantage created the new subsidiary cruise line when Regent Seven Seas, which had operated the ship for more than a decade, announced it would not renew its contract in 2010. Vantage tapped David Giersdorf to head up Paul Gauguin Cruises. Giersdorf, a veteran cruise line executive who was an executive vice president at Holland America and president with Ambassadors Cruise Group (which formerly owned Windstar), stayed on as president and CEO of Paul Gauguin Cruises during the transition before stepping down. Diane Moore is president of Paul Gauguin Cruises, joining the line in 2010. She was previously president of Windstar Cruises. The m/s Paul Gauguin, which had been managed by Regent Seven Seas since its debut, has had numerous owners since its launch in 1997. The first to own it was the French firm Societe Services et Transport. Boston-based Grand Circle Travel and Vantage Deluxe World Travel (the owners of Grand Circle and Vantage are brothers) jointly acquired Paul Gauguin in 2004 but soon after Vantage Deluxe World Travel took sole ownership of the cruise ship. Pacific Beachcomber is the current owner. 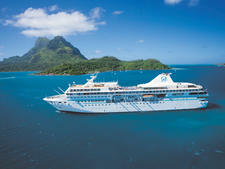 Polynesia-based, 332-passenger ship lures couples with French cuisine, a water sports marina, anticipatory service and included tips and drinks. The Tahiti-based m/s Paul Gauguin is a perfect fit with its tropical surroundings, with old photos of Tahiti and Polynesian artifacts on display. And like the islands it visits, the onboard atmosphere is laid-back -- while still maintaining high standards of luxury and passenger pampering -- and absolutely romantic. Onboard, the crew-to-passenger ratio of 1 to 1.5 and one of the highest space to passenger ratios (58 to 1) of all ships catering to North Americans. The ship features all oceanview cabins, nearly 70 percent of which sport balconies; three restaurants, including the French-Polynesian L'Etoile and the indoor/outdoor La Veranda, which at night becomes a French Bistro featuring menus designed by Jean-Pierre Vigato, chef-proprietor of a Michelin-starred Parisian restaurant; and a watersports marina with windsurfers, kayaks, paddle boarding, snorkeling gear and scuba equipment. Paul Gauguin is an all-inclusive offering, so gratuities, soft drinks, select wines and spirits are included in the fare. In January 2012, Paul Gauguin went under the knife for a $7 million refurbishment, in addition to the extensive rework in 2012. Shipwide renovations included new flooring and replaced carpeting, new furniture, new window treatments and decorative wall panels. Additionally, all cabins feature gained teak railings on the balconies and new bathroom flooring. The ship's restaurants, lounged promenade deck and casino were also remodeled. The line attracts an interesting mix of ages. Numerous honeymooners join well-traveled 40-somethings and senior citizens onboard. Paul Gauguin Cruises currently consists of a fleet of one: the eponymous m/s Paul Gauguin. The 332-passenger, 19,200-ton ship was custom-built in 1997 for cruising the waters of the South Pacific and has been the longest continually operating year-round upscale ship in the region.